The Norwegian Maritime Authority (NMA) wants to create new emissions control areas (ECAs) where marine fuel is capped at 0.10% and scrubbers are banned. "In practice, this means that the use of heavy fuel oil in the world heritage fjords will be banned, and that ships that currently use heavy fuel oil combined with an exhaust gas cleaning system will have to use marine diesel instead when sailing in the world heritage fjords," NWA explains. In June this year the NMA proposed new legislation to tighten emissions rules in the Nærøyfjord, Aurlandsfjord, Geirangerfjord, Sunnylvsfjord and Tafjord. Based on the comments received following the review period, NMA says it is now proposing the even stricter requirements for the new legislation. This has now been circulated for review over a six week period. 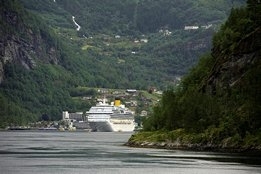 "The Government wishes to reduce the emissions and discharges from cruise ships. Stricter requirements for ships in the world heritage fjords would be a step in the right direction," says Minister of Climate and Environment, Ola Elvestuen. For existing ECAs and the upcoming IMO 2020 rule, the use of scrubbers is permitted to enable vessels to achieve an equivalent route to compliance while continuing to burning otherwise noncompliant high sulfur bunkers. But in the absence of a universally accepted scientific assessment of marine scrubbers' environmental performance, debate over their use has become increasingly heated. Highlights in recent weeks include recently-formed IMO 2020-focused marine scrubber advocacy group, Clean Shipping Alliance 2020 (CSA2020), insisting that research shows scrubber washwater is not harmful to the sea; Euronav CEO, Paddy Rodgers, meanwhile, last week joined a growing number of voices suggesting that open-loop scrubbing was "very vulnerable to future regulation," and even major scrubber manufacturer Alfa Laval has moved to ease Shipowner concern that future legislation could outlaw the use of open-loop scrubbers. NMA is clear its proposal covers all scrubbers, be they open, closed, or hybrid systems.